Apple’s change in release cycle this year has resulted in the speculation that there will not be an iPod touch refresh this Fall. Because of the iPhone 5’s postponed announcement, it was believed that Apple’s typical music event in September would take a backseat to new iPhone hardware. 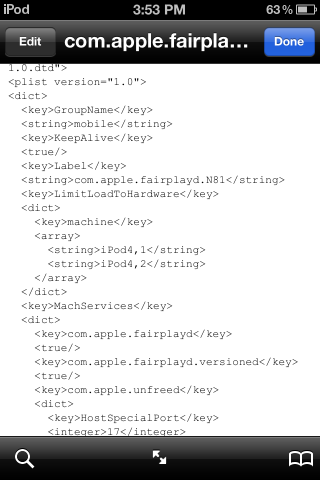 An iFans forum member has done some snooping in the iOS 5 beta and found references to a future generation iPod touch. Will we see an iPod touch 5G after all this Fall? While this isn’t much to gawk at, the identifier does allude to a slight upgrade in hardware for the iPod touch, as the model number is only one variant away from the current generation. TUAW has noted that this reference is also present in iOS 4.3. Apple has consistently released iPod touch generations alongside new iPhone hardware, as was evidenced with the iPod touch’s A4 processor and the iPhone 4. It’s believed that the next iPhone will feature Apple’s faster A5 chip, so it wouldn’t be a stretch to see a new iPod touch with matching specs for the holiday season. What do you think? Would you be excited for Apple to release a new iPod touch this Fall, even if it was just a specs upgrade?